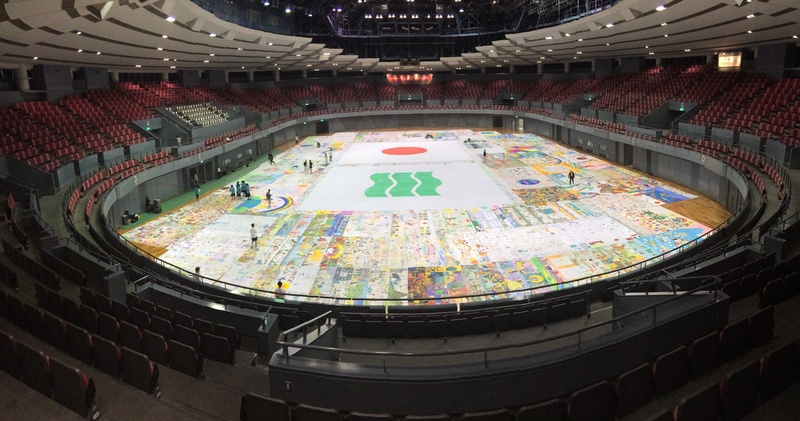 We held "THE BIGGEST PAINTING IN THE WORLD 2015 70th Anniversary of A-bomb in Hiroshima" in Hiroshima Green Arena. 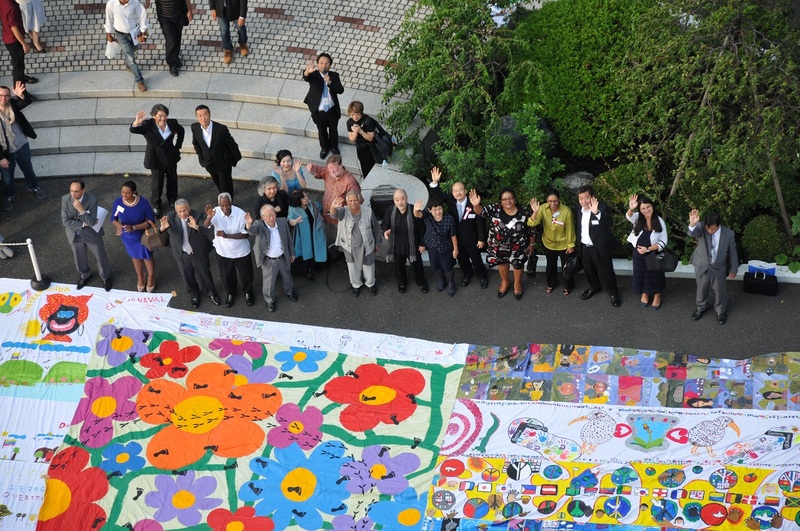 We held “THE BIGGEST PAINTING IN THE WORLD 2015 70th Anniversary of A-bomb in Hiroshima” in Hiroshima Green Arena. We held the Biggest Painting in the World 2012 in front of Chiddingstone castle in Kent in the United Kingdom. "The Biggest Painting in the World 2012" was exhibited at Showa Women's University. “The Biggest Painting in the World 2012″ was exhibited at Showa Women’s University. The presentation received the honor of attendance by Mr. Muhammad Yunus and Embassies in Japan. 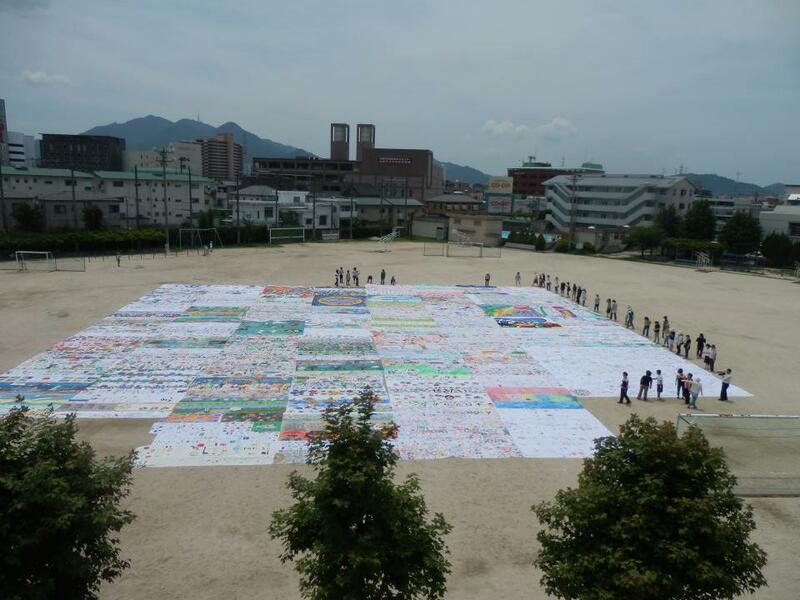 We are sewing the 64 clothes of 5m x 5m, which are made by several-hundred children in the disaster area and the children in 36 countries and 22 cities, into The Biggest Painting in the World 2012 of 40 m x 40 m. Several-hundred mothers of kindergarten in Hiroshima are participating in this sewing event. 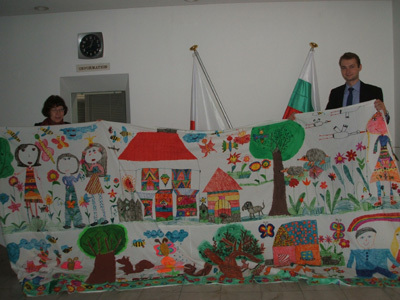 Embassy of the Republic of Bulgaria: The cotton sheeting painted by the children of the Republic of Bulgaria has come back to us. Embassy of the Republic of Bulgaria: We presented cotton sheeting for the painting. Embassy of the Republic of Bulgaria: We visited the Embassy of the Republic of Bulgaria and presented cotton sheeting for the painting. Embassy of the Republic of Bulgaria: We had of meeting Attache Culture,Press,Science Ms.DANIELA NIKOLOVA,Ph.D.